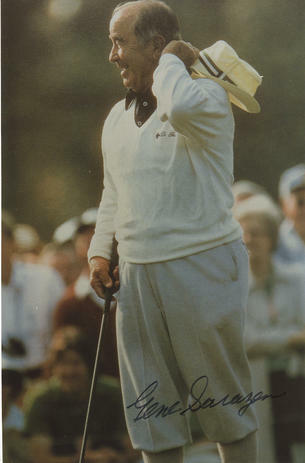 This is a superb Hand Signed Colour 6.5" x 4" Photo of the Legendary American Golfer who was one of only 5 Golfers ever to win all the Major Championships. He was a Winner of 39 P.G.A Tournaments and died in 1999 aged 97. Gene Sarazen (February 27, 1902 - May 13, 1999) was an American professional golfer, one of the world's top players in the 1920s and 1930s. He is one of five golfers (along with Ben Hogan, Gary Player, Jack Nicklaus, and Tiger Woods) to win all the current major championships in his career, the Career Grand Slam: U.S. Open in 1922, 1932, PGA Championship in 1922, 1923, 1933, British Open in 1932, and The Masters in 1935.